Today’s free eBook is How To Network At Networking Events: 5 Simple Steps On Best Practices For How to Network at Networking Events and Maximize Your ROI. Written by Tyler Wagner, it’s perfect for conference attendees who might need a little help optimizing networking events. Whether you’re a student trying to land a job, an entrepreneur trying to grow your business or someone who just needs a wider circle of influential people in their life, this is the tool you need. This book has 5 simple rules of actions you can take before networking events to ensure your success increases exponentially. The reality is, none of us were ever taught how to succeed at these events. No one sits you down to explain how it works, and you certainly don’t learn this in any college course. In this practical, easy-to-read and action-oriented book, Tyler Wagner explains how you can become more successful and grow your network by attending networking events the correct way. By drawing examples from his time as a student, entrepreneur, and years of coaching, he shows the reader how to maximize their networking skills in a conference setting and in their everyday life. · Conference Hacks for getting into conferences for FREE and getting the most value out of every networking event you pay for. 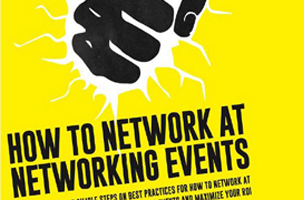 How To Network At Networking Events: 5 Simple Steps On Best Practices For How to Network at Networking Events and Maximize Your ROI is available as a free download on Amazon from 06/10/2014 – 06/14/2014. As of this writing, the book has an average of 4.5 out of 5 stars from 11 customer reviews. For more free eBooks, check out our 10 Websites to Download Free eBooks list, as well as our Free eBook of the Day archive, previously on Appnewser.